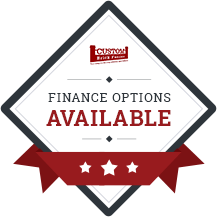 Are you interested in a quality fence or gate for you home? 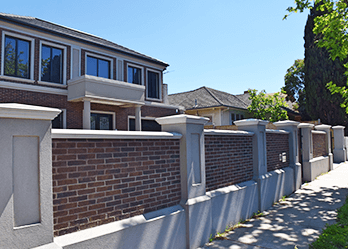 At Custom Brick Fences we are the local experts Melbournians rely on for the best home fences and gates. From Knox to Brighton, we offer our services to customers across the greater Melbourne area. We have been in the business of manufacturing a range of custom-made fences and gates for over 15 years. 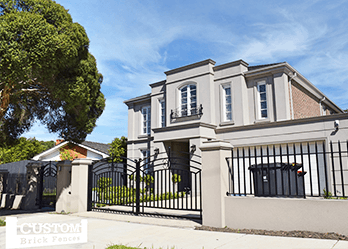 This wealth of experience has allowed us to grow into one of Melbourne’s most trusted specialists in fences and gates. We like to distinguish ourselves from our competitors by focusing on the needs of our customers first, so you’ll be guaranteed above average service when you come to Custom Brick Fences. At Custom Brick Fences we make sure to put you first. 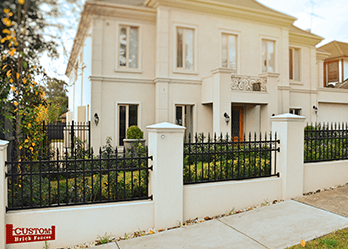 Whatever type of home design you have or special requirements you might need for a fence or gate, Knox residents will benefit from our qualified professionals, who can help every step of the way. Through our custom design services, we can generate a unique product according to all your needs. If security is your priority, we design our gates and fences with the right amount of height to offer you compete privacy and safety. On the other hand, if the aesthetic of a gate or fence is important to you we also create various elegant styles, from wrought iron gates to steel picket fencing, your home will look great with one of our stunning designs. Do you need a premium fence or gate today? Knox residents can contact us at 1300 88 68 38 or 03 9874 5102. In addition to Knox, we also provide services in Nunawading, Ringwood, Sandringham, Surrey Hills, Templestowe, Toorak, Wheelers Hill and surrounding suburbs.